No one ever said you could only unlock Xbox LIVE avatar awards through Xbox 360-only games. With that said, the Xbox LIVE Windows Phone game Chickens Can’t Fly now has three avatar awards available to unlock. 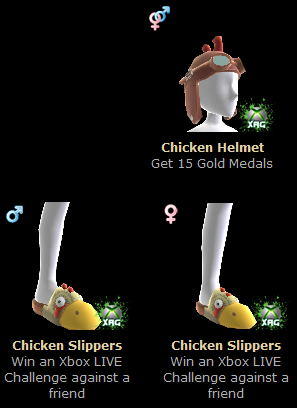 The avatar awards available include a Chicken Helmet (unlocked at 15 Gold medals), and chicken slippers (male and female – unlocked when you win an Xbox LIVE challenge against a friend). It definitely is great to see an Xbox LIVE Windows Phone game bring some avatar awards, even after the game has been available for some time. As far as we know, this is the first Xbox LIVE Windows Phone game to offer avatar awards. Chickens Can’t Fly has an average rating of 4.5 out of 5 stars on the Windows Phone marketplace, and is available for purchase for $2.99 at the moment. We remind you, it is also an Xbox LIVE game therefore a free trial is available. The download link is available below. If you purchase the game, be sure to unlock the new Xbox LIVE avatar awards now available!